Wow, so I survived my first Romantic Times Convention. It was like a 24-hour circus -- bright, shiny and sparkly with all kinds of fantastic happenings. What made it for me? The people! I loved reconnecting with old friends, meeting online friends for the first time, and, of course, making new friends. 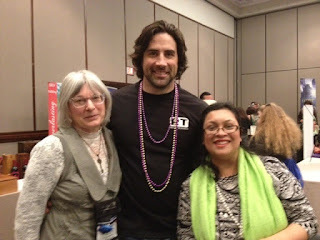 I met some of my favorite authors (Beth Ciotta, Caridad Pineiro, Laura Kaye, Beverly Jenkins and more), hung out with other authors and aspiring writers, met lots of very nice readers (including a few who have actually read my books! Woohoo! ), and also some very nice cover models! Speaking of cover models, I made sure to snap a lot of eye-candy pics for you! See what a thoughtful person I am? Lol! 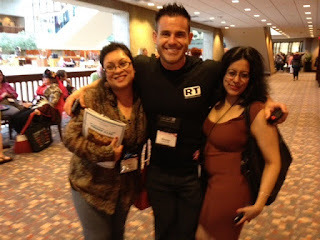 With cover model Charles (who always had a smile) and author Suleikha Snyder! With my crit partner author Lucie J. Charles and all-around nice guy (& cover model) Harvey Stables.